C1S7CD7 I get confused between what is Americana, or Alt Country, or just Country music and suspect it doesn't matter really good music is good music. So this album sits in my section that covers all of those genre's and includes, Johnny Cash, The Jayhawks, Steve Earle, Grand Drive, Drive By Truckers etc. This album sits within this sector unless someone can tell me differently as a country tinged masterpiece. 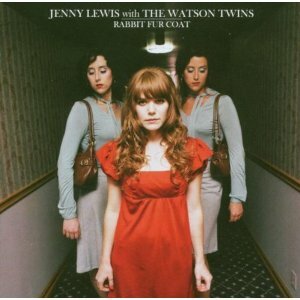 This was the first album that Jenny Lewis made outside of the wonderful Kilo Riley (who might turn up here one day) and she is backed by the Watson Twins, gospel singing siblings from Texas. The Watson Twins have gone on to make great music on their own and Jenny has released quality recording under various guises the latest being Jenny and Johnny. So on to the album, as you would expect beautiful harmonies can be found throughout this album no more so than on the opening track Run Devil Run which is sung acapella. The rest of the tracks are a great slice of country with quality songwriting taking centre stage. All of the tracks are original other than the cover of The Traveling Wilburys Handle With Care, where Conor Oberst (Bright Eyes) duets with Jenny. The songs on the CD are timeless and could have been written anytime over the last 30 or 40 years and that is a complement to the artists as the CD transports you back in time to America maybe around the time of the depression, when music was played in sitting rooms for entertainment. This is a quality album by some quality artists who have proved that they can release music either together or in collaboration and keep the music to an exceptional standard.